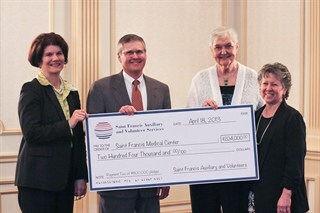 The Saint Francis Medical Center Auxiliary presented $204,000 to Saint Francis Healthcare System board of directors vice chair Clyde Nenninger, at the annual Auxiliary and Volunteer Appreciation Luncheon on April 18. The donation is the second installment of an $800,000 pledge over four years. Since its start in 1959, the Saint Francis Auxiliary has provided fundraising and volunteer activities benefiting Saint Francis and its patients. The Auxiliary and volunteers have grown to more than 400 members, who donate nearly 50,000 hours of dedicated service yearly – which translates into nearly $1.5 million dollars in addition to the annual financial donation. Beyond the generous gift of time, the Auxiliary has also raised substantial funds for many of the Medical Center’s special projects and expansion plans. Judy Heisserer was named the 2013 Auxilian of the Year at the luncheon. Heisserer has been a volunteer at Saint Francis since September 1986, and has logged more than 4,000 hours. She’s spent time in many areas of the Medical Center, including the Information Desk, Registration Center, Pastoral Care (as a Stephen Minister and Eucharistic Minister) and now the Surgery Waiting Room. Beyond her volunteer work, Heisserer is also very involved in the Auxiliary, which she joined 12 years ago. In 2005-2006, she was Membership Chair and from 2006 to 2010, served as the Auxiliary Board Corresponding Secretary. One of Heisserer’s passions is the bake sale. She will spend days before each sale making scones, muffins, quick breads, dried dumplings, noodles, cinnamon rolls, coffee cake and more. Outside of Saint Francis, Heisserer shares her time and talents with other organizations: St. Augustine church and school, the Southeast Missouri Food Bank and Meals on Wheels. For more information on the Saint Francis Auxiliary or Volunteer Services, call 573-331-5166.